Domestic violence is a criminal offense that is now treated very seriously by the courts after high profile cases such as O.J. Simpson’s murder trial, which highlighted the dangers of what was previously treated as a private family matter. Many domestic violence crimes are “wobbler” offenses that can be charged as either a felony or a misdemeanor. Being convicted of domestic violence can carry direct penalties as imposed by the court as well as collateral consequences that can affect the defendant for the rest of his or her life. Many people who have been charged with domestic violence offenses often want to know what these potential consequences may be. If the defendant is charged with a felony-level domestic violence offense, such as corporal injury to a spouse in violation of California Penal Code Section 273.5(a) PC or criminal threats pursuant to California Penal Code Section 422 PC, he or she can potentially be sentenced to prison if convicted. In many cases, a domestic violence conviction can be considered a “strike” under California’s Three Strikes Law designed to increase sentences on violent repeat offenders. Defendants who are convicted of misdemeanor level domestic violence crimes, such as domestic battery under California Penal Code Section 243(e)(1) PC, and defendants who are convicted of felonies can be placed on probation for a specified period of time. 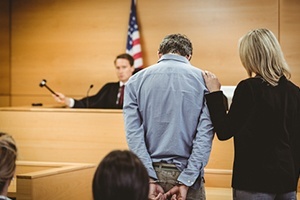 Probation may be supervised or unsupervised and will typically require that the defendant remain law abiding and complete several terms of probation. Several terms and conditions of probation will typically be required of a defendant who has been convicted of a domestic violence offense and placed on probation. The defendant may have to serve time in jail as a condition of probation. The Court will generally require that the defendant complete anger management or domestic violence counseling. Missing sessions or failing to complete the classes in a timely manner may result in a probation violation. The judge may also require that the defendant complete community service or community labor hours as a condition of probation. The defendant would have to pay extensive court fines as well as restitution to the victim for any damages incurred. Typically, the court will issue a protective order prohibiting the defendant from having any contact with the victim. The judge may consider modifying the order to allow peaceful contact between the parties if requested by the victim, however some judges may still require a full restraining even where the victim wants contact. This can be devastating to families who wish to stay together and work out differences. If the defendant is found to be in violation of the protective order, he or she can face a probation violation as well as new charges under California Penal Code Section 273.6 PC. In addition to the penalties imposed by the sentencing judge, there are numerous collateral consequences associated with a conviction for domestic violence. The defendant would lose his or her ability to own or possess firearms upon conviction of a domestic violence offense. In addition, these offenses are considered crimes of moral turpitude and may subject a non-citizen to removal, deportation, exclusion from admission to this country or denial of naturalization. A domestic violence conviction can jeopardize professional licenses and would appear on background checks conducted by potential employers. If you or a loved one have been arrested for domestic violence, it is imperative that you discuss your case with an attorney experienced in handling domestic violence offenses immediately. Michael Kraut is a former Deputy District Attorney with over 14 years of prosecutorial experience who knows how to effectively defend clients charged with domestic violence. In many cases, Mr. Kraut’s early involvement in a case has resulted in charges being significantly reduced or even rejected entirely. For more information about domestic violence sentencing, and to schedule your free consultation, contact Michael Kraut at the Kraut Law Group located at 6255 Sunset Boulevard, Suite 1480, Los Angeles, CA 90028. Mr. Kraut can be reached 24/7 at 888-334-6344 or 323-464-6453.